Here are my starting pieces from left to right. Ends of handle: 90º elbow, 2 ¾ inch pipe. 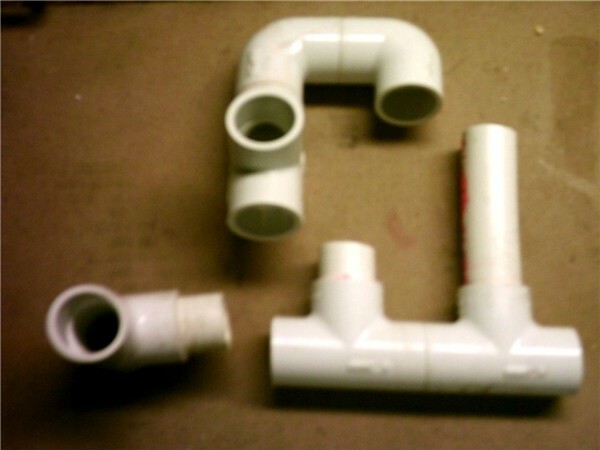 Main body: 4.5 inch pipe, 1.5 inch pipe, 90º elbow, 3-way T joints 4-way cross joint. 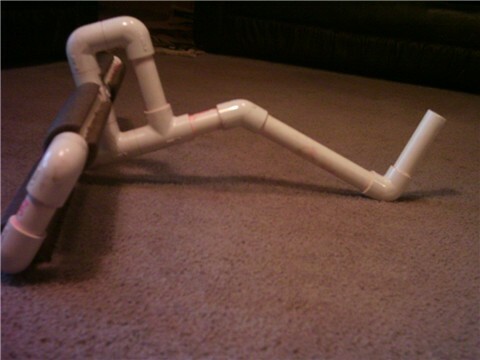 Front extension: 4 inch pipe, 8 inch pipe, 3 inch pipe, 90º elbow, 45º elbow. I started with the pieces on the right to make the extension with loading pin. The end caps are only to make it lay flat so it is easier to assemble. The end caps are NOT glued on. Next I assembled the main body. 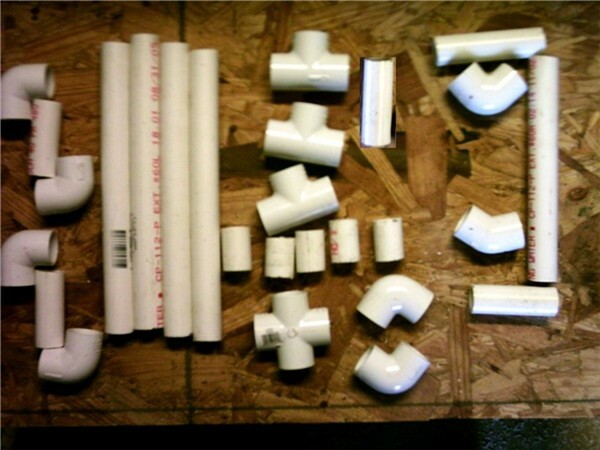 A 1 1/2" long pipe is used to secure the various joints to each other. 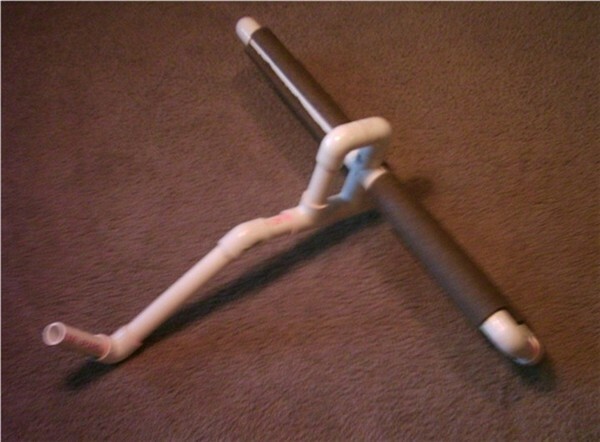 The top assembly used two 1 1/2" long pipes, two 90º elbows, and the 4-way cross joint. 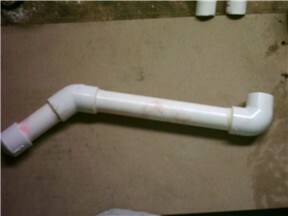 The bottom left assembly used a 1 1/2" long pipe and a 3-way T joint. 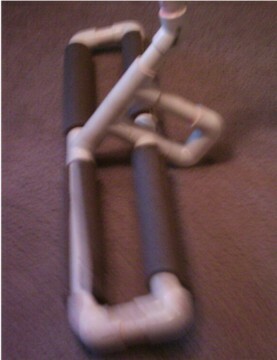 The bottom right assembly used two 1 1/2" long pipes, two 3-way T joints, and the 4 1/2" long pipe. All three sections will be joined together. Use extra PVC cement. It takes a little longer to set so allows one to make small adjustments if necessary. However it must also be held longer to set. I usually go with a 10 count. Dry fit EVERYTHING before gluing. Assemble components separately as much as possible. (See main body photo.) This way if one section is messed up it can be redone without losing the rest of your work. That final assembly is crucial though. Dry fit various assembled/glued components before gluing AGAIN. Dry fit the parts that will be perpendicular or cannot be pressed on a flat surface. Measure, eyeball, use a level to line them up. Then mark both pieces (magic marker, nail scratch) so when you are assembling with glue you can quickly get the pieces in the correct position. Keep rags or paper towels handy.